Sling. Ranged Weapon Attack: + 3 to hit, range 30 ft./120 ft., one target. Unarmed Strike. Melee Weapon Attack: + 1 to hit, reach 5 ft., one creature. Laurentiana had one day been left behind as a baby in front of the Bear’s Head Inn. She was wrapped in swaddling clothes with nothing but a carved piece of wood she was chewing on. Kira, the innkeeper noticed the name “Laurentiana” carved on the chewing toy so assumed it was the baby’s name. No one knows who may have left the baby, although it’s believed that a passing adventurer may have done so. Some witnesses claimed to have seen a pregnant human, along with a few other fellow travelers, wander through the town at about the time the baby was found. Nevertheless, Kira turned the baby over to Mival and Seffie Bucksman, a young couple who lived in town and had tried to have a baby of their own. Laurentiana’s affinity for nature appeared at a very early age. She loved everything about the outdoors. 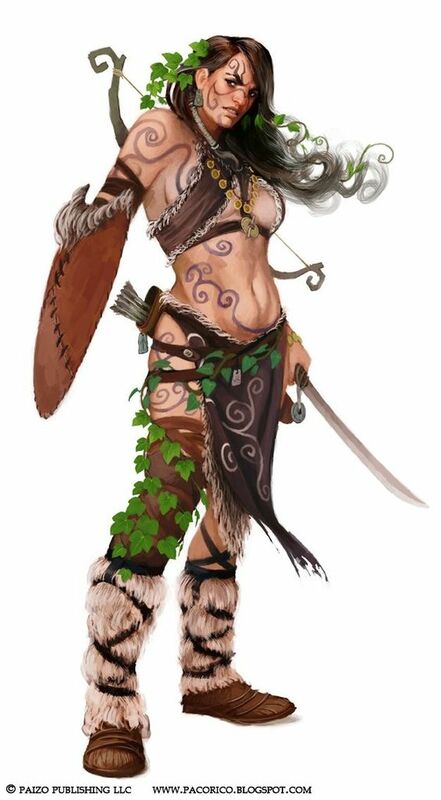 For the past year, Laurentiana had been under the tutelage of Natali Barleytruth, a halfling druid follower of Chauntea. Natali Barleytruth is well known for her brewing skills with regards to honeyed ale. Natali feels that Laurentiana could best learn by seeing the Realms beyond the walls of Bear’s Head and so has asked the Champions of the Vale to take her with them as they journey across the Realms.